This is the world’s biggest painting of an elephant – aimed at making a jumbo-size contribution to save the species. The magnificent life-size ‘big tusker’ has so far taken artist Jonathan Truss three weeks – during which an estimated 2,500 elephants have been killed for their ivory. 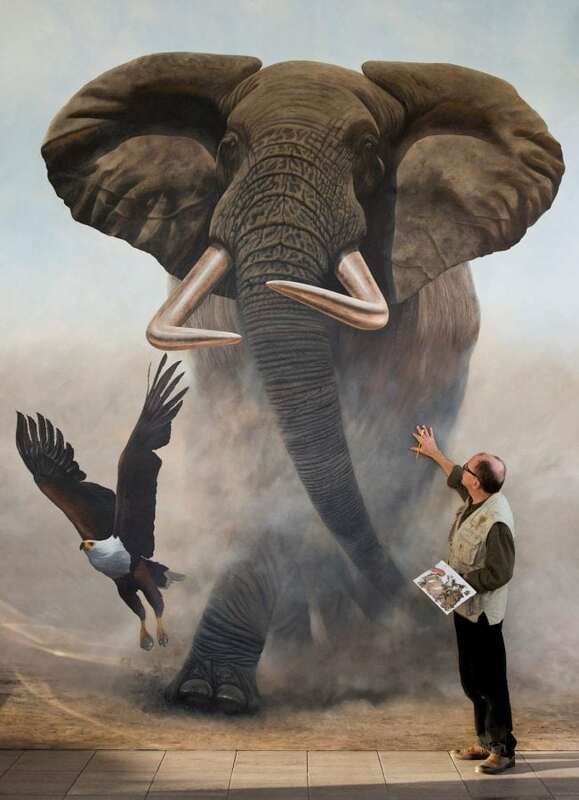 His elephant appears to be charging from the 15′ x 12′ canvas in the stunning 3D-like work. Jonathan, 55, whose paintings sell for thousands, set himself the huge challenge to raise money and awareness for wildlife charities. He hopes the finished work will fetch six figures when it is auctioned at Christmas, with the money going to conservation causes. 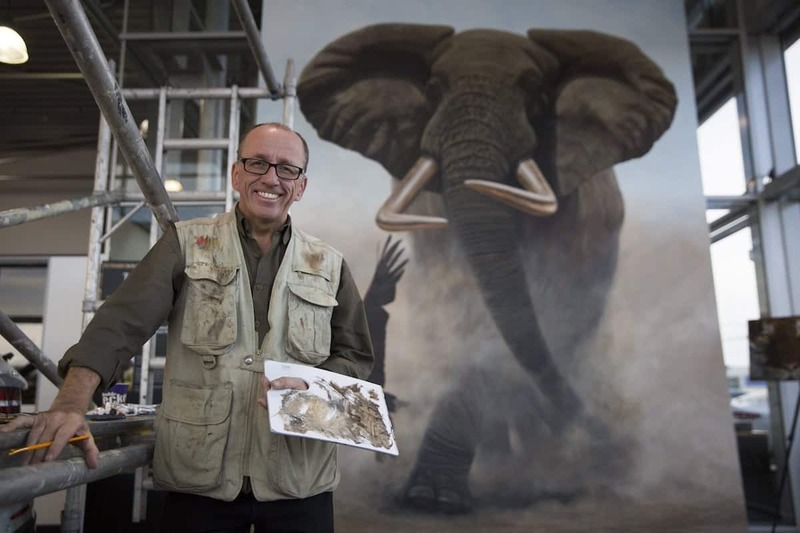 Jonathan, one of Britain’s best known wildlife artists, chose an iconic male elephant known as Satao (corr) as his model. The giant was one of the rapidly-diminishing number of so-called ‘Big Tuskers’ – elephants with tusks weighing a staggering 100lb EACH. He lived in Kenya’s Tsavo East national park and was one of the biggest and best-known of the beasts until he was felled by a poacher’s poisoned arrow last May. Conservationists estimate there are now as few as 30 big tuskers left in the wild and they could be gone completely by the next generation. Jonathan, of Bournemouth, Dorset, said: “Above all else I love elephants – when I’m with them I know it’s as good as it gets. “I’ve been to Africa many times over the last 25 years and seen thousands of elephants, but none as magnificent as Satao. “It’s appalling to think there are only about 30 big tuskers left – that’s all – and just six in the whole of Tsavo, a national park the size of two Israels. “It takes a tusker to make a tusker so when these big guys are gone they are gone forever. “You can’t imagine how incredible and exciting it is to see these big male tuskers if you’re lucky enough. “Sadly, our grandkids won’t and tragically our kids probably won’t either at the current rate of extinction. 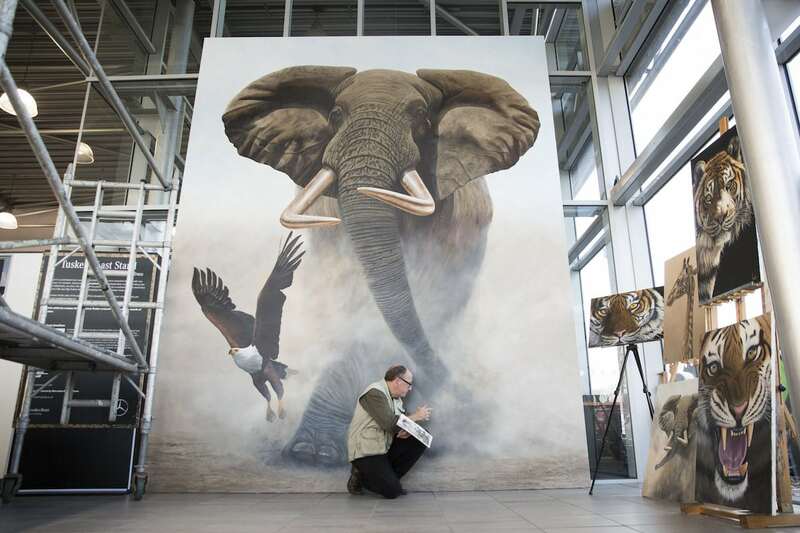 The huge painting – the first lifesize of a big tusker – is entitled ‘Tuskers Last Stand’. The canvas alone cost over £2,200 and is so big Jonathan had to leave his studio because it was not big enough. He was invited into the Mercedes Benz showroom in Poole, Dorset where he has painted it over the last three weeks. Jonathan added: “As far as I know this is a unique painting. “Although a few life-size elephant paintings have been done before, nobody to my knowledge has ever done a full life-size big tusker. “I wanted to portray the tusks as if they are really coming through the canvas, and for people to feel they are standing right next to it. Jonathan is now putting the finishing touches to his giant and hopes to complete it by the end of the month. He is inviting sealed bids for it with the bulk of the money raised going to conservation causes. They are The David Shepherd Wildlife Foundation, Tsavo Trust, David Sheldrick Wildlife Trust and Saving the Survivors.